This week the world lost Rita Miljo, the founder of C.A.R.E. (the Center for Animal Rehabilitation and Education), who died earlier this week in a fire at her home at the centre she founded for baboons in South Africa. Bobby, the first baboon she ever saved, back in 1980, also died in the fire. Known as “Mama Zimfene” to her admirers, this “Mother Teresa of Baboons” followed along the same passionate lines of Dian Fossey’s work with gorillas and Jane Goodall’s work with chimpanzees. Against the odds, she pioneered ways of reintroducing whole troops of rehabilitated baboons back into the wild, which had hitherto been unheard of. Even Nelson Mandela participated in one of the releases. Rita Miljo was an inspirational woman who was revered by many in the primate conservation world. Her loss has saddened an entire community. 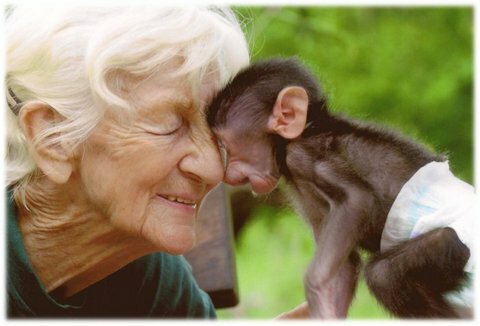 For a more in-depth story of Rita and her work, please read the following article, written by adventurer and author (and father to my friend, Kelcey), Pete Grimm, who knew Rita on a personal level: Glimpse the Life of Living Legend Rita Miljo, Baboon Woman of C.A.R.E. Rest in Peace, with the baboons in heaven.